Shaken, not stirred: The innings of destiny !! The innings of destiny !! After months of waiting and anticipation the moment that Cricket fans have been so eagerly waiting for is underway. The 11th ICC Cricket World Cup is in motion. Fourteen nations from all across the Cricketing world are slugging it out down under in a month and a half long gruelling battle of Strength, Strategy, Wits and Stamina. It remains to be seen which of these nations will triumph ultimately and carve their name in the annals of Cricketing glory. For India, the world cup just could not have started better. Thumping victories against arch rivals Pakistan, the strong Proteas, minnows UAE and Ireland has set the momentum and all across the nation and fans are rejoicing as India has smoothly sailed into the semi-finals. For many Indians, winning against Pakistan is like winning the world cup itself and is enough reason to celebrate. But then again, Indians don’t need any excuse to celebrate Cricket. It is no big secret that the billion plus people who reside in the world’s largest democracy follow the game with a zeal and passion that rival the most extreme of religious fanatics. Productivity will be at an all-time low as students and professionals will cut classes and bunk office for watching matches. Even the most workaholic of executives will take time off to check the scores on their laptops or smartphones. Politics and social issues will take a backseat as Cricket will form centre-stage of all discussions. The usually crowded malls and multiplexes will wear a deserted look. For the entire duration of the tournament, Indian players will be under intense scrutiny by the Indian media and fans. And this kind of attention brings about huge pressure, as expectations will be sky high. Fans will expect the Indian team to retain the cup they won in 2011 and nothing less will suffice for them. Credit goes to Dhoni and his boys for tackling the huge pressure and expectations to lift the trophy after a gap of no less than twenty eight years(India won it's maiden world title in 1983) in front of a delirious home crowd in Mumbai. If the Indian team of 2011 was burdened with huge expectations to live up to, the 1983 world cup winning team had none. In fact, no one really expected them to qualify for the knockouts, leave alone win the tournament. As Kapil Dev, the captain of the Indian 1983 World Cup Squad said in an interview, “No one even gave us a ghost of a chance”. In the early eighties India were yet to find their footing in the one day Cricket scenario. Established contenders as they were in test cricket, their one day prowess left a lot to be desired. And if their record in the previous world cups (One win in 1975 and no win in 1979) was anything to go by, people would consider India lucky even to win a few matches. Indian Cricket itself was in a volatile state. After a disastrous tour of Pakistan four months prior to the tournament, Sunil Gavaskar was forced relinquish the captaincy. After some deliberation, the board decided to entrust the captaincy to Kapil Dev Nikhanj, a raw and inexperienced youth from Haryana. Kapil was a newbie and had yet to earn the respect of his team mates. But he was brave and not averse to taking risks: perhaps just the tonic that Team India needed. Just for the record, the 1983 World Cup consisted of eight teams divided into two groups of four teams each. India were placed in a seemingly tough group alongside the mighty West Indies, Australia and minnows Zimbabwe. England, Pakistan, New Zealand and Sri-Lanka were in the other group. Each team was to play the other team twice. The top two teams in each group would progress to the knock-outs. Critics predicted a cake-walk for West Indies and Australia. Entering with no expectations, India started the 1983 tournament with a bang, defeating the West Indies in their first league encounter followed by another victory against Zimbabwe. A few eyebrows were raised. Many however, considered the victory against the West Indies a fluke. India failed to make the most of the winning start and fell behind with losses to Australia and the West Indies again in their second league encounter with the giants. They desperately needed a win in their remaining league matches (against Zimbabwe and Australia each) for any hope of them qualifying for the knockouts. Many thought that the match against minnows Zimbabwe would be an easy victory while the match against Australia would be more challenging. Little did they know how close India came to being eliminated against the minnows. India and Zimbabwe met at Turnbridge Wells, England on the 18th of June 1983. India won the toss and elected to bat first on a green pitch which the Zimbabwean seamers exploited to their lethal advantage. The pitch proved a mine-field in the initial overs and four Indian wickets fell rapidly, much to the dismay of the Indian supporters present. Gavaskar, Srikanth, Mohinder Amarnath and Sandip Patil arrived and departed the crease in quick succession. The score-board read nine runs for the loss of four wickets. 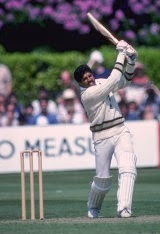 Kapil Dev, the Indian skipper sauntered in. Many did not know it yet but he was about to play the innings of a lifetime. Soon, the wicket of Yashpal Sharma fell and the score read seventeen for five. It was all looking bleak for India. A pall of gloom fell on the Indian spectators. If India were to lose this match, they would not qualify for the knock-outs and would have to return home bearing the ignominy of defeat. The sceptics would have been proven right and the media would have written off their initial victories as flukes. The organizers feared that the match would be over before lunch time and they would have trouble controlling the Indian crowd which was growing increasingly volatile. But destiny had other things planned. For the next couple of hours Kapil held his nerve and batted cautiously to steady the ship even while wickets were tumbling at the other end. Other batsmen arrived and returned back to the pavilion without giving much support to their skipper. India looked in deep peril with the score reading seven for seventy eight. Madan Lal came in and gave some much needed support to his skipper. When he fell, the score read one hundred and forty for the loss of eight wickets. India were not out of the woods yet. Syed Kirmani, the Indian wicket keeper came in. Kirmani supported his skipper beautifully and together, they put on one hundred and twenty nine run partnership for the ninth wicket, a record which still stands today. Kapil, on his part paced his innings beautifully. He played with caution at first taking his runs in singles and twos, striking the odd boundary till he reached his century in the 49th over. After that he was a tiger unleashed. He struck the ball with brute force to all corners of the ground and many times over it as well. At the end of sixty overs, Kapil’s score read an incredible one Hundred and Seventy Five runs while India’s score was a respectable Two hundred and Sixty Six runs for the loss of nine wickets. The score was still within reach by the opposition but it was far better than what would have been given India’s top order collapsing like a pack of cards. Rejuvenated by their skippers knock, India fought back like tigers and restricted Zimbabwe to two hundred and thirty five runs, with Kapil again being in the thick of action taking a few vital wickets. India had pulled of an incredible victory, thanks to the courage and the never-say-die attitude of one man. Cricket is a team game, but sometimes it takes a special individual performance to lift the sagging morale of the entire team. Clearly, Kapil’s innings made the entire difference between victory and defeat. The BBC camera crew were on strike that day which is a pity; as one of the greatest cricketing knocks in Indian One day Cricket history went unrecorded. Many people fondly remember the famous victory over the West Indies in the 1983 final, but few remember that had it not been for the champion performance of a spirited leader a few matches earlier, India would have never got there.